This science fair project was done to find out the effect of using tea leaves as fertilizer for enhancing plant growth. Testing was done using the rose plant planted in soil mixed with tea leaves. Rose plants planted in soil containing tea leaves, grow more quickly. Used tea leaves can be very beneficial to indoor and outdoor household plants. The compost helps to concentrate nutrients and beneficial bacteria in liquid form, for the plant’s roots to absorb them more easily. They also help to prevent soil borne diseases and provide the leaves of the plant with a protective coating. Tea compost is slightly acidic and can be used to neutralize basic soil. It can also be used to make the soil acidic for plants that require soil with lower pH levels. 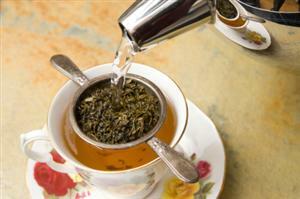 The caffeine found in tea leaves is also believed to enhance plant growth. Tea is also rich in potassium, which is an important nutrient for plant growth. Tea leaves have also been found to be beneficial to mushroom growth. By using a ratio of 1:1 for tea leaves and peat, the growth of mushrooms can be hastened. This will help to reduce the need for cutting down trees in order to effectively grow mushrooms. 1. For this science fair project, the independent variable whether the soil has been mixed with tea leaves or not. The dependent variable is the growth rate of the rose plants. This is determined by measuring the height of the rose plants every week. The constants (control variables) are the size of the pot, the size of the plant, the type of rose plant, the amount of water and the amount of sunlight. 2. The 10 rose plants are separated into 2 groups of 5 pots each. The average height of the plants is obtained by totaling the height of the plants in each group and dividing that by 5. The average height calculated is recorded in the table below. 3. The rose plants in one of the groups are removed from their pots. Their soil is mixed with the used tea leaves. The mixing ratio should be 1 part tea leaves to 2 parts of soil. The rose plants are then planted back into the pots. The word “tea” is written on the 5 pots containing the tea leaves, to help differentiate them from the other group. 4. The 10 pots are placed in a location where they are able to receive the same amount of sunlight. They are watered once a day with the same amount of water. 5. The height of the plants is measured once every week for the next 4 weeks. The average height for each group of rose plants is obtained by totaling the height and dividing by 5. The calculated average is recorded in the table below. The results showed that the plants that were planted in soil mixed with used tea leaves, grew at a faster rate over the 4 weeks. The graph below represents the results of our science project experiment. The hypothesis that rose plants planted in soil mixed with tea leaves will grow more quickly, is proven to be true. Compost soil is known to be very good for plants but using compost made from tea leaves has been found to be even better for enhancing plant growth. The tea compost is known to provide many benefits to plants, especially rose plants. The used tea leaves are also a rich source of antioxidants for the plants. Try to repeat the science fair project using different types of plants. The science project experiment can be repeated using grounded coffee instead of tea leaves.